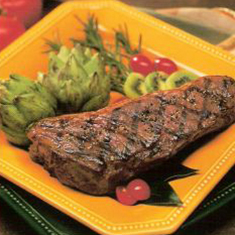 Rub your favorite cut of Bison Steak with a combination of lemon pepper, garlic salt and olive oil. Grill steaks 4-6 inches above medium hot coals (325°). *Do not use a fork to turn steaks. This punctures the meat, allowing the juices to escape.